As Freddy promised he was indeed dead and Jason swore he had retired to hell, the slasher genre found itself in need of a few new slashers. Before the search was rendered moot by Jason and Freddy's return from the grave (the lying bastards), horror fans were forced to suffer through such wannabes as Dr. Giggles and Leprechaun, with only 1992's Candyman appearing as a worthy heir to the throne that Scream would eventually claim. 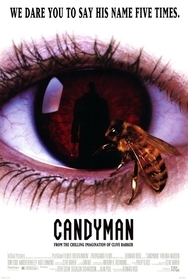 Based on a short story by Clive Barker and transplanted from the slums of Britain to the projects of Chicago, the literate and utterly creepy Candyman examines the power of myth and the role of imagination in fear. 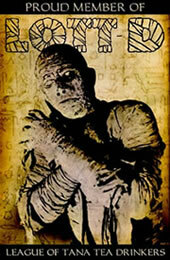 The titular legend involves the son of a slave who was tortured and murdered for impregnating a white woman. For revenge the townspeople cut off Candyman's hand, inserted a hook into the stump (why I'm not sure, but if makes for a grisly weapon) and covered him with honey before leaving him to the bees. He has haunted the bedtime stories and nightmares of his Chicago burial ground every since, shedding innocent blood when his name is spoken five times into a mirror. In my town the legend involved Bloody Mary, who would appear in your mirror if you turned out the lights and spoke her name three times to your own reflection. Which is why the film works so well: The legend of Candyman is a version of a campfire ghost tale most kids have probably encountered in some form of another. What Barker and Paperhouse director Bernard Rose ask us is "What if, through enough believers in his existence, a mythical figure could transform from chilling apparition to flesh and blood terror?" The story revolves around Helen Lyle (Virginia Madsen), a University of Illinois graduate student doing her thesis on urban legends. As much to prove her professor husband (the always sleazy Xander Berkeley) and his academic cronies wrong, Lyle sets out to Candyman's alleged home, the notorious Chicago housing project Cabrini Green, to explore the legend of the hooked killer. When Lyle casts doubts upon the existence of the supernatural figure, Candyman feels obliged to re-capture the faith of his "congregation." From the films opening sequence (a flowing tracking shot high above the Chicago interstate, backed by the first notes of composer Philip Glass' classic score), Candyman drips with atmosphere. Though Rose does occasionally resort to out-of-frame scare tactics, most of Candyman's dread comes from the grungy, graffiti filled walls of Cabrini Green and Glass' accompaniment, a mix of synthesized music and operatic vocals. But for all the dark, sinister atmospherics, Candyman falls short of its aspirations. Starting with the cliché of the innocent victim blamed for the murders of an unseen madman and ending with an extremely ill-advised reincarnation twist, the script beings to stray from the probing inquiries that initially serve as the film's backbone. However, the letdowns in narrative merely reduce Candyman from genre classic to slasher classic, with the film's biggest drawback being that it probably helped inspire both Urban Legends films. Submitted by Anonymous (not verified) on Mon, 2010-08-23 23:23. I suppose that a lot of what the author has to say is true about this movie, but I liked it. However, I would use spell check and re-read over my work before publishing it online... People might just take this review more seriously.